Two years ago, 28 UP alumni artists were invited to chronicle the Philippines history in 30 large-scale paintings that comprised the Sining Saysay: Philippine History in Art. The art exhibit is a joint project of the University of the Philippines (UP), the UP Alumni Association (UPAA) and the Araneta Center. The participating artists depicted the local political maturity including the Chinese, Spanish and American influences and its role in Philippine history. The commissioned UP Artists were Adonai Artificio, Armand Bacaltos, Adi Baen-Santos, Grandier Bella, Benjie Cabangis, Ben Cabrera, Angel Cacnio, Romeo Carlos, Cris Cruz, Denes Dasco, Gig De Pio, Simkin De Pio, Vincent De Pio, Neil Doloricon, Norman Dreo, Amado Hidalgo, Abdul Asia Mari Imao, Ben Infante, Gigi Javier-Alfonso, Aileen Lanuza, Romeo Mananquil, Norlie Meimban, Julius Samson, Jonahmar Salvosa, Randy Solon, Michael Velasco, Jun Yee, and Janice Young. “Sining Saysay: Philippine History in Art,” opened to the public on February 18, 2015. 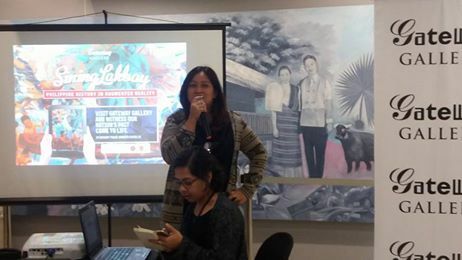 Now, Gateway Gallery celebrated the second year of its “Sining Saysay: Philippine History in Art” exhibit last February 22, 2017 with the launching of its digital interface that utilizes augmented reality (AR) to recount Philippine history and make it more appealing to digital-savvy youth generation. Dubbed as “Sining Lakbay: Philippine History in Augmented Reality,” the project marries art and technology to give visitors a more enhanced experience of its long-term collection. It seeks to create awareness of history among the youth by appealing to their interest in digital technology. Sining LakbayThe “Sining Lakbay: Philippine History in Augmented Reality” project is a product of careful and creative implementation spearheaded by artists, filmmakers, historians, curators, editors, and technology providers. It aims to be a platform for gallery guests to have a more enriched experience of “Sining Saysay”, a collection of 30 large history paintings that resulted from the collaboration between the University of the Philippines and the Araneta Center. To give Gallery visitors a more immersive experience, 10 paintings from the collection will “come to life” on their WIFI-enabled digital devices like mobile phones and tablets using the Layar app that can be downloaded for free (on iOS and Android). Users will then be able to scan the selected paintings on their device to watch the video and hear the narration on chapters of Philippine history. The videos are accurate historical accounts of events depicted in the paintings. Each video lasts roughly three minutes, with the whole tour lasting about 30 minutes total. This launch is just the first phase of an even bigger project of making all 30 paintings in the collection AR-enabled. A year after Gateway Gallery opened on November 21, 2014, it received an accreditation from the Department of Tourism. And in over two years of operations, the Gallery has grown its art collection to 50 artworks donated by various artists. Attendance has also risen to an average of 200 visitors a day in the same period. The Gateway Gallery will continue to expand its horizons this year, providing artists a home to hone and showcase their craft, and giving the Filipino public a haven of learning and creativity. With its vision to make arts and culture accessible to ordinary Filipinos, Gateway Gallery will continue programs that introduce arts to young children, holding art workshops for hobbyists, portrait sketching sessions for professional artists, and hosting talks by artists and historians. It has a lot of projects lined up for this year that include the Reading Nook (mini library for all ages) highlighted by story-telling sessions for kids in partnership with Adarna Publishing plus the Bravo Weekend, which showcases Filipino culture through music and dance. Located at the 5th level of the Gateway Tower at the Araneta Center, Gateway Gallery is free to the public and is open Mondays to Sundays from 10AM to 7PM. 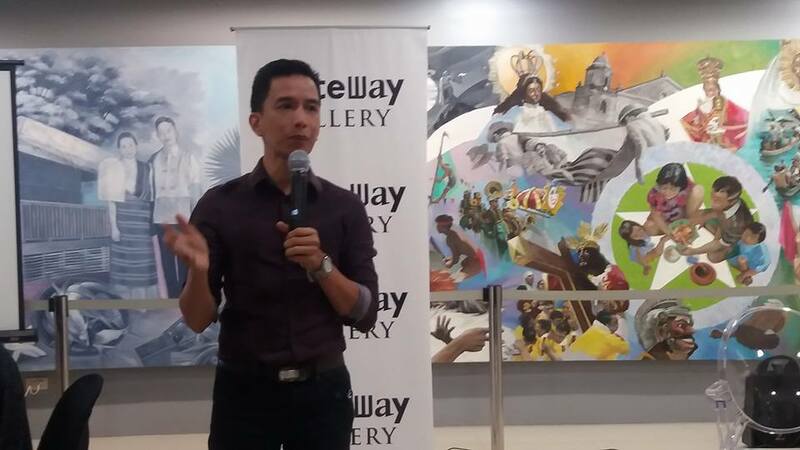 Gateway Gallery is supported and managed by the J. Amado Araneta Foundation, the CSR arm of the Araneta Group.